In early May my wife and I realized we would have exactly 2 weeks to escape after our summer commitments and before school began. We decided on Israel and somewhere in Europe. We wanted to maximize our time so I looked for a flight out on motzei Shabbos. I discovered that in August there are maybe 6 flights from the nyc airports that leave after 10:40pm. Since shabbos ended at 9:06pm the week we wanted to leave we didn't want to leave before then. I found availability on a delta flight to Manchester departing at 10:41pm. First step . There was a connecting flight with availability to Paris so I added that to the plan. We would spend 4 days in Paris before heading to Israel. I was a bit worried if we would make the flight with 1hr 35min to get to the airport, check-in and get through security. I figured with so few flights departing at that time, what could go wrong? Hint: Of course something went wrong that night! Before booking the flights I checked the PH Paris and there was availability. I bought 4 Hyatt nights, booked those first as they are refundable and then booked out tickets on Delta. I delayed buying the flight from Paris to Israel as they were expensive and I was hoping an award flight would open before we left. We were ready to head off to Paris! Fast forward a month. In June a friend asked me to find him a nice island in Europe for him and his wife. After a simple google search, which obviously was waaayyyy too difficult for him to do, I found a website with 20 unique islands in Europe. I scrolled through the first few and was not impressed. Then popped up the picture of the Faores. It was out of this world. With the endless grassy cliffs, multitude of birds, dozens hikes and lack of tourists this place just became number one on my bucket list (luckily I have been fortunate enough to shorten this list a lot recently). First step was convincing the wife. This was the difficult task. I googled pictures of the Faroe islands, copied a few links, and included them in an email titled "am I crazy?". I quickly sent that email and started researching flights. Before I had time to make my first search I got a response "Cancel Paris. We are going there!". I quickly realized the islands have one airline called Atlantic airways. They own 7 planes (and two helicopters) and mostly operate to and from Denmark. 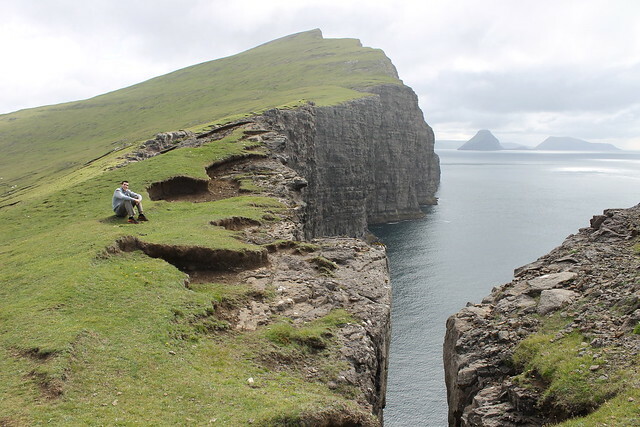 I searched for flights from Manchester and Paris to the Faroe Islands and the best price was from Manchester 11 hours after we landed from JFK, with an ON connection in Copenhagen and an early flight the next morning to the islands. 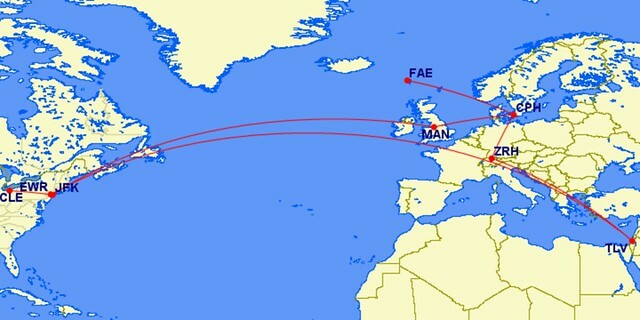 Updated itinerary- JFK-MAN DL J with 11 hours to explore. Sunday nigth MAN-CPH in Y with overnight. Monday 7am flight to Faroes on Atlantic airways Y is the only way to get there- sorry snobs! Getting to Israel would be fun. We needed to get there by Friday morning. Atlantic airways has very few partners and 2 levels of tickets- cheap and expensive. We were able to get some of the cheap bucket for the flight to the islands but no cheap, returning flights were left for that week. So we had to settle on leaving the Faroes Wednesday night, landing in CPH at 11:30pm. This gave us 3 complete days on the islands and 2 nights. We were initially afraid this was not enough time, but in hindsight it was the perfect amount for us. To maximize our time in CPH we found a 7pm flight (Thurs.) to Zurich on SAS J (Euro business) and then in lie-flat from ZRH to TLV at 11pm arriving around 4am Friday morning. The flight from Faroes was cash and we paid 25k SQ for the CPH-ZRH-TLV in J. To get back from Israel we had a very tight window and the only availability was on Elal for nearly 100k amex each in J. I swallowed that. I just booked Jan. 9-12 for you at the Conrad. It's only got a 15 day cancellation so lots of time to figure out if it will work for you. I've got no idea what the up charge for an OWB this time of year is but will email them if you like. I can also double check that the main chef that knows so much about kashrut will be there. If he's there he'll hook you up for breakfast and can also fix you fish, potatoes, etc. and will let you in the kitchen to check whatever you want (eggs for blood, scales on fish, etc) and he knows to let you light the flame and he keeps separate glass plates to serve on. The Conrad can also arrange kosher meals from Australia for about $40 per meal. I'd offered upthread to trade 30k SPG per Conrad night so it would be 90k total. If you are interested PM me and if not, I can cancel it. I took out the chase hyatt to get 2 nights at any category property but the Andaz Maui doesnt seem to let me book unless im staying for 6 or 7 night minimum. Anyone find a way around it? seems a waste to use it on the Regency (and I dont want to reroute trip to go to GHK just for that). call in to do that. no guarentees but you can try. Also, maybe try to book 6 if you have points and then cancel the non-cc nights. Planning a trip to the big island and Maui in May. I'm looking for good hotel deals or point/cc award options, would appreciate any feedback or PM. Hi. Complete newbie here. Sorry for all the questions. I have the Amex SPG and do not really know or use the benefits of the card. I fly Delta 2 to 3 times a year and keep getting CC offers from them. I know Delta and Starwood have crossover rewards. Does it pay to have both cards? Are SPG rewards/points only good for hotels? Would you recommend the Delta card over the SPG? If yes, is the Delta Platinum worth the extra $100.00 yearly fee over the Delta Gold? Any advice would be greatly appreciated. Basic answer is unless you are doing a lot of spending and status is important to you- go with SPG all the way. points are worth more because much more versatile. Can be used at hotels as you know and they transfer to airlines at a bonus! every 20,000 points you transfer becomes 25,000 miles. And now that they can be combined with Marriott you have more hotel options and even some hotel+flight redemptions. Re: Manhattan Kosher Restaurants After these arguments my reservation has been made at Nobo. Re: Hyatt Awards And Upgrades Master Thread keep on calling a rep can help you. But play stupid and say there is availability when I search for these nights together. can you please help?